Before we continue with this article, we want to stress the importance of attempting to solve a problem without physical altercation. Try your best to deescalate a situation before it becomes a fist fight. There are obviously many dangers when you’re fighting someone, not only from the impact you make on each other, but the impact of someones head bouncing off concrete. A head bouncing off concrete can lead to many problems such as concussion or death. Keep these possibilities in mind when you’re angry and about to let fists fly. A street fight isn’t worth someones life, no matter how angry you are at the time. If you would like to be trained for real life self-defense situations, please visit our article on the 10 Reasons Why You Should Study Martial Arts. I always try to avoid street fights when I can, however this guide will still do a great job in teaching you how to win a street fight. Knowing what not to do in a physical fight is just as important as knowing what to do. When an attacker comes into striking range with you, the worst thing you can do is let your guard down. Watch your opponents body language, if they clinch their fist they are most likely preparing to punch you. Continue to step back and keep a good distance while talking to your opponent. Stay out of striking range while they are still being aggressive. Remember, your opponent could be on drugs or could possible have a weapon. This is especially dangerous when the opponent is a random stranger being aggressive towards you. Don’t assume a fighting stance yet if the situation can still be defused. However the moment that a physical altercation takes place, assume a good fighting stance and posture so that you’re not easily moved. DO NOT LET YOUR GUARD DOWN, under any circumstance. This is especially important in a street fight where there are no rules. 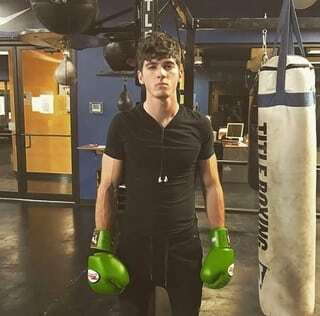 – Hands are up and alert, always stay active with your hands, never let your guard down in a street fight. – Chin tucked! This is so important, keeping your chin high in the air will leave you susceptible to getting knocked out. Believe it or not, we’re completely serious. If you believe a situation has escalated to the point of no return, throw the first punch, especially if your opponent is bigger than you. The best advantage you can give yourself is ending a fight before your opponent even gets a chance to react. Throwing a punch that lands clean will possibly rock your opponent, or at minimum create the opportunity to throw more punches. Landing with a clean punch will help you end a street fight before it even starts. Push forward and be aggressive, if the fight goes to the ground then use grappling to submit your opponent (we’ll talk more about this later). Once you have the advantage, don’t let up until you sense there is no more danger. This DOES NOT mean continue punching an unconscious opponent. If you knock out or choke out your opponent, get up and stop attacking them. Continuing to punch or choke an unconscious opponent can lead to serious brain damage, or even death. This type of fight is usually when two people stand up and trade blows, this is usually agreed upon beforehand because most street fights usually make their way on the ground. A standup fist fight has a high chance of a knockout, because the typical untrained fighter will typically swing their fists recklessly. This usually involves reckless swinging with chins up and absolutely no defense. Don’t let this be you, don’t leave yourself susceptible to a knockout in the street, because you never know if your opponent will stop after you’re unconscious. This is another reason why it’s so important to win a street fight and not be on the losing end. You can practice standup fighting by shadow boxing in the mirror. Throw basic punch combinations and work on your footwork and head movement. If you need more tips on how to improve your standup fighting or boxing, please visit our guide on how to become a better boxer. The most common first punch thrown in a fight is the right hand or right hook. As we explained earlier, almost all street fights will eventually go to the ground. This can happen from someone being punched and knocked down, or it can happen from someone being tackled or taken down. This type of fighting will be an advantage for people who have wrestled in school. The best thing you can do in this situation is get in a dominate position. Either get on top of a person in a mount position, or get behind a person and take their back. This position is great because you’re able to do some good ground and pound, which will eventually lead to your opponent rolling over (and then you’ll have their back). In the mount position you can throw all types of strikes at your opponent, like punches and elbows. Be careful if you’re on a concrete type of surface such as the street or sidewalk. Hitting the back of your head or your opponents head off of concrete can lead to serious brain damage or death. Also, be careful when throwing punches while grounded on a concrete surface, it’s very possible to break your hand off the ground if you miss your opponent. When you’re in the mount position and inflicting serious damage on your opponent, they will eventually roll onto their stomach. This is the perfect time to take their back and end the fight with a submission. The most common submission is the rear naked choke because it’s quick and effective. When you have your opponents back it just happens to be the perfect position to choke them. If you start choking your opponent chances are that you’ve won your street fight, however don’t let your guard down for one moment during or after the choke. Be respectful after the fight is over, while also being aware of any other possible attackers, especially if the person you just fought isn’t alone. If you win the fight and your opponent is with friends, those friends might want a round two (or some sort of redemption for their friend). You always need to keep your guard up before, during, and immediately after a street fight. I hope that this article has given you the confidence to win a street fight, however I hope that you’re never in this situation.